These bridal shower invitation templates are meant for the DIY bride who needs a quick solution for customized, personailized bridal shower invitations. These are simply the wording for the invites. You must tap into your crafting abilities to work with these little templates. 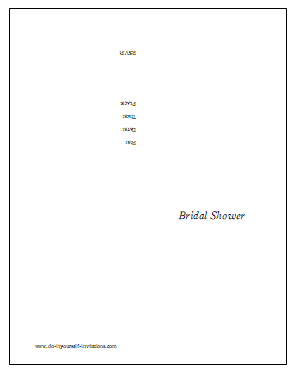 For those looking for a more "print and go" kind of solution, we also offer free printable bridal shower invitations as well. Get creative! These templates can be used to replicate many of the ideas featured on Do It Yourself Invitations. You can print them onto pretty paper, add stickers or dried flowers. Wrap a pretty bow around it. 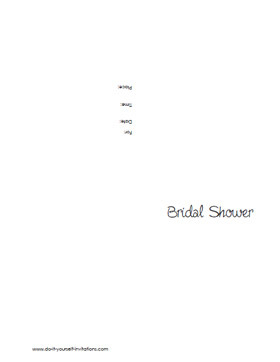 With a little thought and creativity you can create some really beautiful invitatins from these printable templates! 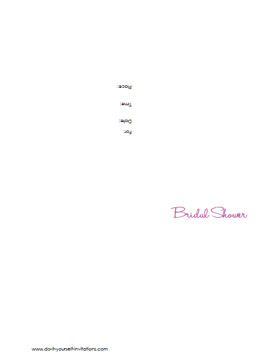 Print them out an either fold them into quaters to creat the invitations, or make a little bit more elegant bridal shower invitations by printing them onto some nice cardstock. Print them back to back and upside down, then cut the paper in half. Fold these in half to create two beautiful cards from one piece of card stock. These invitation templates are in the form of a PDF file. You will need a PDF reader in order to view them. Adobe PDF and Foxit Reader are both free and available to download on the internet.